Most people have probably heard of the Knights Templar, mediaeval military monks best known for their Order being forcefully suppressed. The sole purpose of the Order was to protect pilgrims, and that meant supporting knights in the Holy Land which required money. Along with many monastic orders the Knights Templar were good at making and managing money to fund themselves and their work. Nobles were particularly happy to endow military orders with gifts and property as a way to win favour with God, because they shared a common interest in the noble art of fighting. A mix of Papal and Regal authority granted the Templars immunity to local jurisdiction and taxation, putting them beyond the law. The Templars were pan European and had a network of estates in England. 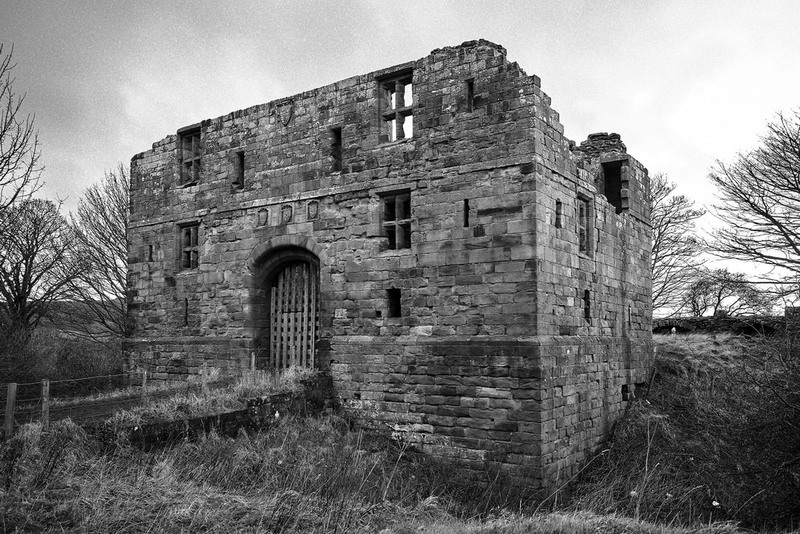 One of these holdings was the Manor of Westerdale in the north west of the North York Moors, which was gifted to the Knights Templar in 1203 by Guy de Bonaincurt. 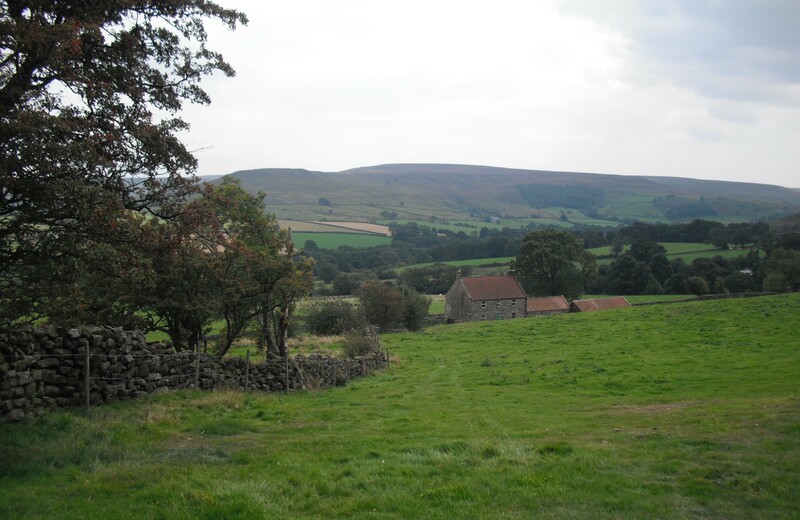 There are also records of additional gifts from other landowners in the wider area, at Kildale, Ingleby Arncliffe, Pinchinthope, and Broughton. At Westerdale a preceptory was founded – a preceptory is a military order’s equivalent of a monastery – and the land put to good use producing income. It’s not known where the buildings and granges were, suggestions include Westerdale Hall and there are earthworks at two sites towards the head of the dale. The Knights Templar Order consisted of Knight Brothers (you had to already be a knight), Sergeants/Serving Brothers, and Chaplains. Then there were the lay servants to do most of the work. There wouldn’t have been knights at Westerdale, but there would no doubt have been servants farming the land. When the Order was surpressed the Manor was recorded as being 1,182 acres and producing £37 of annual income. The Order didn’t long survive the end of the Crusades in the Holy Land. Pope Clement V issued a bull in 1307 telling all Christian monarchs in Europe to arrest Templars and seize their assets. The dissolution in England was drawn out and non-violent. The Manor of Westerdale was taken by the crown in 1311 or 1312 and then held until it was either given or sold to the Knight Hospitallers (the other major military order) in 1338. Two hundred years later it went back to the crown during the Reformation.. The fantastically named Temple Lushington Moore was a celebrated Victorian/Edwardian architect, particularly renowned for his ecclesiastical commissions both inside and out. He conceived new churches* and restored/rebuilt churches**, many of which are now listed. He also designed decorative church fixtures such as screens, windows, reredos, lecterns, and pulpits. Moore’s style was Late Gothic Revival with its focus on the mediaeval: for example pointed arches, buttresses, vaulted ceilings, ornamentation and decoration. There was a lot of new building/rebuilding of Anglican churches at this time; to serve the growing urban populations and to rival the pull of the evangelical low church congregations. The Gothic Revival style linked directly with the high church tractarian movement at the end of the 19th century. The exaggerated style presented an idealised medieval past in reaction to mechanisation and industrialisation. The enthusiasm for the style itself could sometimes result in the destruction or diminishing of original mediaeval elements of the buildings being ‘restored’. Temple Moore worked on a number of commissions in and around the North York Moors and elsewhere in Yorkshire which earned the appellation for his work of ‘gothic with a Yorkshire accent’. The North York Moors has a statutory claim to fame, because one of the first Tree Preservation Orders in England was served in the village of Sinnington. It was served to protect an area of woodland known as The Stripe to the north of the village. It was an ‘interim’ TPO made under the Town and Country Planning (Interim Development) Act of 1943. This Act was followed up a few years later by the Town and Country Planning Act 1947. This legislation looked to build a new country, depending on receiving permission. It aimed to control development and protect the best elements such as buildings with special architectural or historic interest as well as trees and woodland, the natural equivalent of the buildings. Where trees or woodland might be under threat and those trees or woodland had an identified amenity value – that is they mattered to local people and the wider landscape – a Tree Preservation Order could be served. Also in 1947 came the Hobhouse Report which recommended the creation of National Parks; however the thing about Tree Preservation Orders is they can be used anywhere not just in protected landscapes, because any tree can be special. Tree Preservation Orders are still a useful part of planning legislation, most recently reiterated in the Town and Country Planning (Amendment) Act 2012. Many people would recognise the House Sparrow (Passer domesticus), a common visitor to garden bird tables and feeders. Less often seen is the smaller Tree Sparrow (Passer montanus), a shyer bird that can be distinguished by its chestnut brown cap and black cheek spots. The Tree Sparrow has suffered a substantial decline in recent decades with a 93% population decrease between 1970-2008. They are therefore on the Red List for conservation concern. Tree Sparrows make use of cavities in trees and old buildings to nest in. They will also build their own nests within thick hedges. During the 1970s and 80s many elm trees were lost to Dutch elm disease which reduced the availability of nesting holes for this and other species. Alternatively, they will make use of nest boxes – projects aiming to expand Tree Sparrow populations place several nest boxes close together as the birds like to live in colonies. A good habitat for Tree Sparrows is mixed farmland where small woodlands, scrubby hedgerows, cereal crops and dead trees can be found together. Aquatic invertebrates are a good food source for their young so farmland ponds are also valuable features. Young chicks are fed on insects to provide them with the minerals they need to develop their bones. 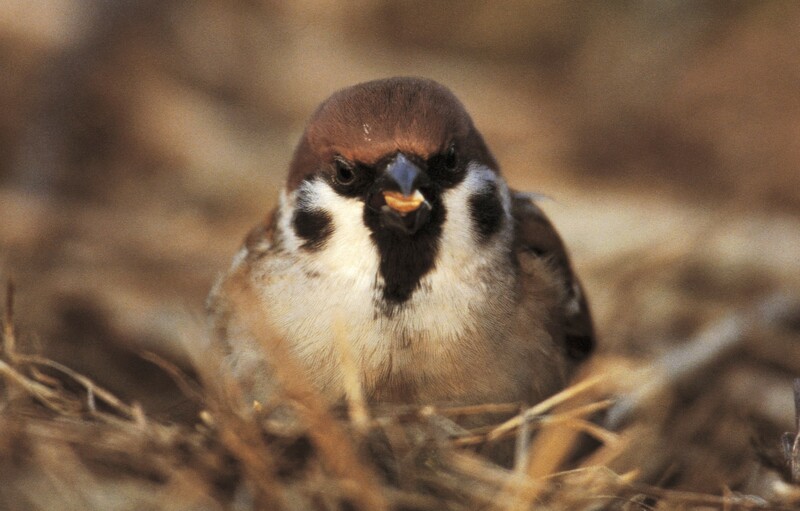 Seeds and cereals, such as wheat and barley, are also part of the Tree Sparrow diet. The southern edge of the North York Moors is a good area for Tree Sparrows, villages such as Hackness, Staintondale, Newton-upon-Rawcliffe and Lockton all have Tree Sparrow populations. There are two types of Twayblades: Common Twayblade (Neottia ovata) and Lesser Twayblade (Neottia cordata). These are orchids, not the blousy bright orchids but much more subtle and discreet. Both have one upright stalk with small clusters of flowers at the top. 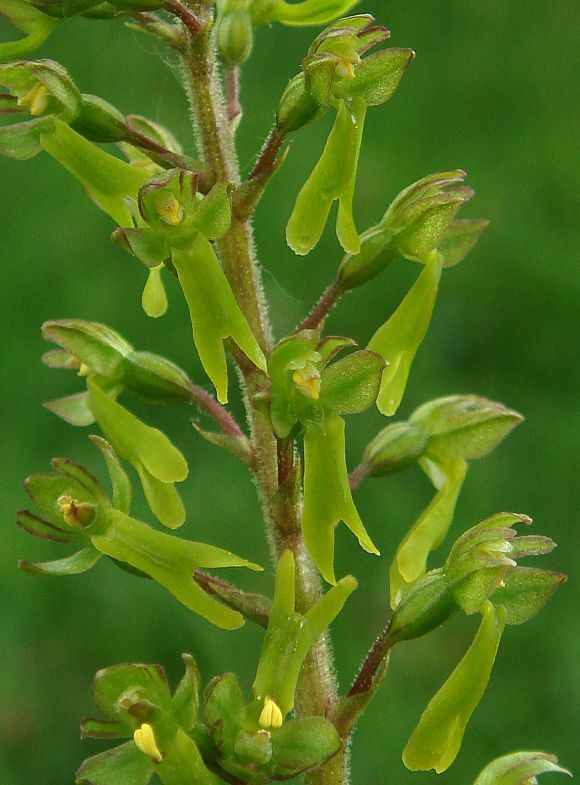 The Common Twayblade has tiny yellow/green flowers and can grow up to 60 cm tall, the Lesser Twayblade has tiny reddish flowers and grows up to 20 cm. The name Twayblade comes from Old English words for two leaves, because Twayblades have one pair of leaves except sometimes they don’t, sometimes there is a third leaf. Common Twayblade are much more adaptable than Lesser Twayblades, growing in neutral/calcareous grassland and woodland. Lesser Twayblades favour acid soil so are found in wet Ancient Woodland and on wet heath. They’re pollinated by tiny insects e.g. flies for Common Twayblade, even smaller gnats for Lesser Twayblade. They both smell, however whereas the Common Twayblade has a gentle sweetish smell, the Lesser Twayblade produces a smell like rotting flesh which humans find unpleasant but gnats like. Both plants produce tiny seeds like dust, but they can also spread through rhizomes from their roots. As well as diminishing habitat, one of the other reasons for Twayblades being relatively rare is because they take such a long time to grow up, it can take a Common Twayblade 15 years to mature enough to flower. Where woodland has existed for at least the last 400 years (c. 1600 AD) it provides an ‘ancient semi-natural woodland’ habitat. Around 4% of the North York Moors National Park is classed as ‘Ancient Woodland’ according to Natural England’s Ancient Woodland Inventory. In some places woodland will have existed for much longer. As well as the removal of woodland, particularly over the last century, there is another slower acting less visible threat to the continuation of ancient semi-natural woodland. This is where ancient woodlands have been planted up with trees such as conifers to create plantation forestry. These sites are still recorded on the Ancient Woodland Inventory, and categorized as ‘Plantations on Ancient Woodland Sites’ (PAWS). 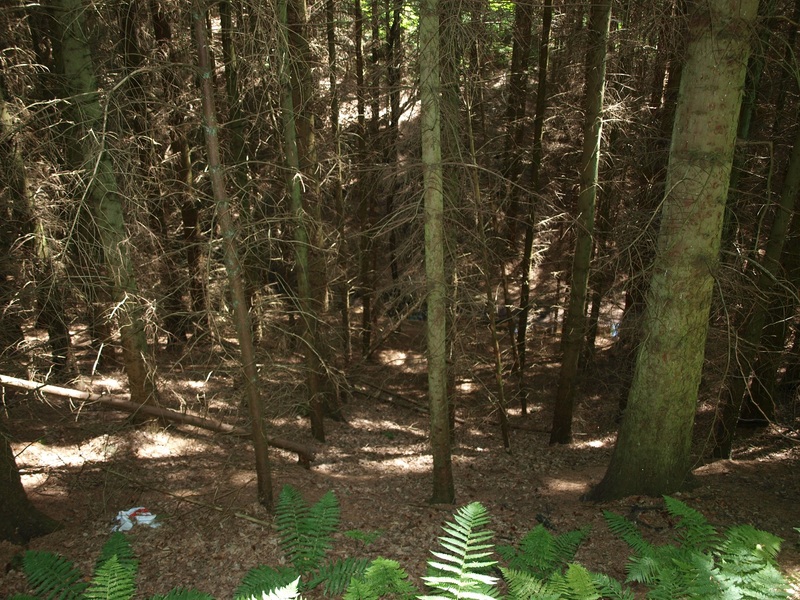 This conversion leads to a detrimental decay of the ecological value of the woodland habitat from the shading caused by evergreen conifers, the acidic modification of soils, and potentially the management of the woodland to ensure maximum timber production. 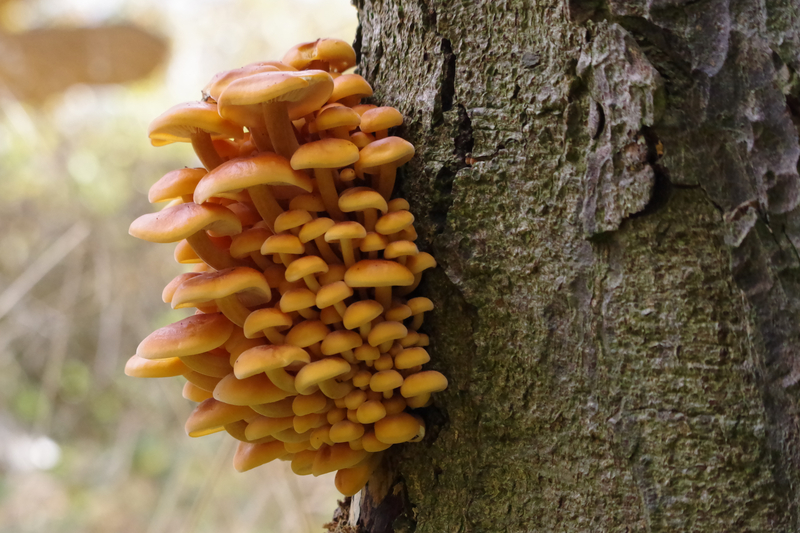 As well as the gradual decline of woodland flora, mycorrhizal fungi and native tree species; historic features within the woodland and the landscape value of the ancient woodland are also at risk. Some habitats can be created/re-created, but when Ancient Woodland is lost it’s gone for generations. However restoration can be possible if it’s not too late. PAWS restoration i.e. management to maintain/enhance the ancient semi-natural woodland habitat elements, comes in many forms and scales from the removal of non-native invasive species like Rhododendron, to the replacement of conifers with predominantly native trees. 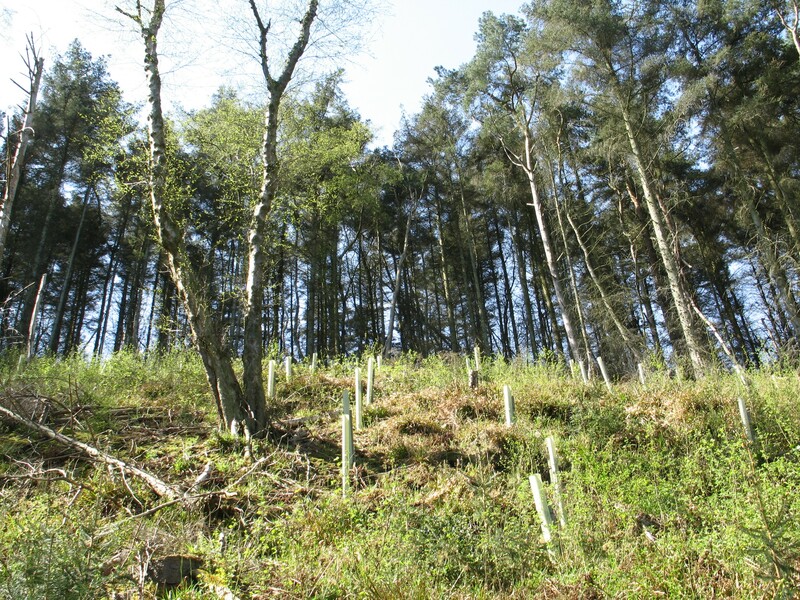 Like most things to do with woodland, restoration takes time. Partial or limited restoration is often worthwhile, and maintaining the management and value of a woodland is often more beneficial than restoring but then abandoning it. The National Park Authority is keen to work with owners of PAWS to explore what might be done to conserve this significant element of our local natural heritage. The ‘Pecten Seam’ is part of the geological Cleveland Ironstone Formation made up of a number of ironstone seams formed one on top of the other during the Early Jurassic period (c. 199 to c. 175 million years ago). The ironstone seams are made up of shales and sideritic (iron carbonate)/chamosatic (silicate of iron) ironstone which settled at the bottom of the shallow sea across the area which now includes the North York Moors (see also Polyhalite below). The seam is called Pecten after the numerous animal fossils found within it from the Pecten genus (large scallops). The Pecten Seam outcrops around Grosmont in Eskdale and is more important in local history for what it suggested rather than what it delivered. It was the identification of the ironstone in the ‘Pecten Seam’ during the construction of the Whitby and Pickering Railway in 1836 which led to the outbreak of ironstone mining during the nineteenth and twentieth centuries in the North York Moors and Cleveland Hills (see This Exploited Land of Iron Landscape Partnership Scheme). The Pecten Seam was the second ironstone seam down (second latest) and quickly turned out to be of a poor quality, so it was the ‘Main Seam’ on top (the latest) which was largely exploited by the local ironstone industry as it was higher up and so easier to access, it contained more ore, and it was thicker than the other seams making it more cost effective to mine. On top of the main ironstone seams were further sedimentary layers of shale containing jet, alum, coal, and further ironstone all of which have been exploited at one time or another in the North York Moors. The word picturesque was first used in the latter half of the 18th century to describe a scene worthy of being painted. It has since come to mean traditional and maybe a bit twee, but originally it meant an image that would stir the sensibilities of every right feeling man (and woman) because of its aesthetics and sublimity. The ‘natural’ and dramatic were in fashion and to not be able to appreciate the beautiful dread inspired by a landscape or view was a poor reflection on a gentleman’s character. 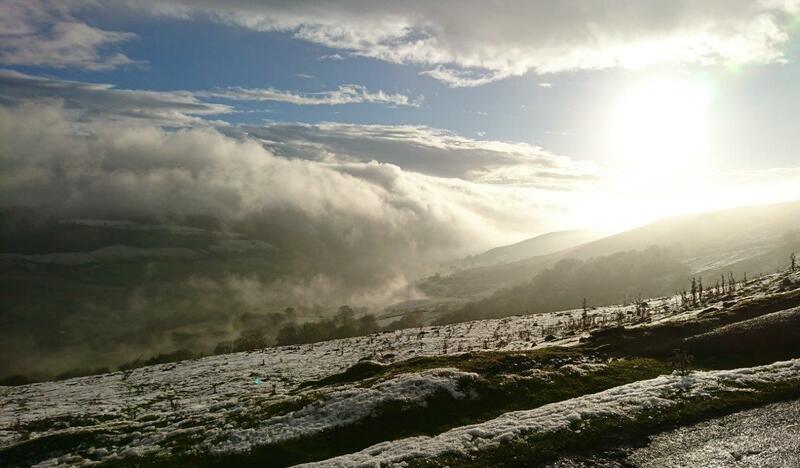 The North York Moors did not have the grandeur of the Lake District’s mountains or the awe of the glaciers of the Alps, but it was not without its picturesque attractions. JMW Turner engraved Rievaulx Abbey in 1836 from sketches he made in 1812. 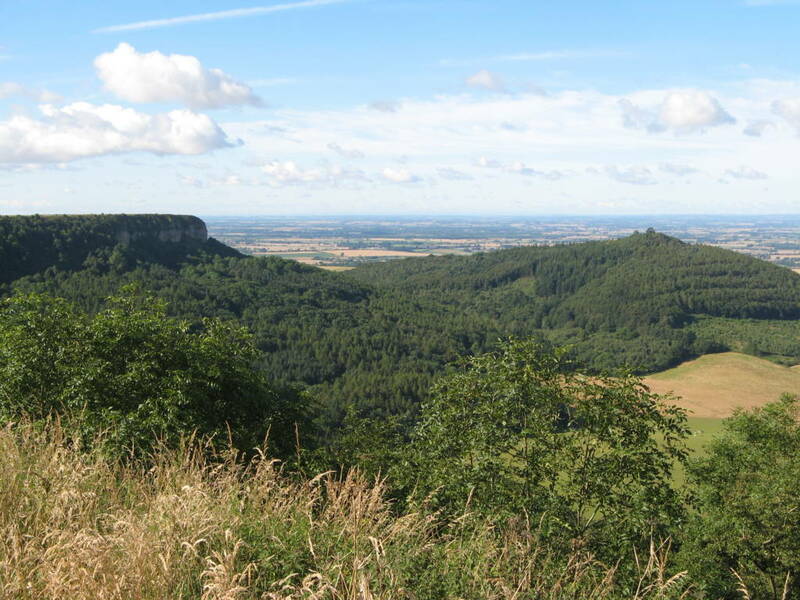 The view contains mediaeval romantic ruins (the might of nature overwhelming the vanities of man), wild woods and Italianate steep hills, a glowering sky and rustic peasants: all highly ‘picturesque’. The ruins of Rievaulx Abbey belonged at the time to Duncombe Park, the Estate had both a ruined abbey and a ruined castle (Helmsley) with which to create its own ‘natural’ picturesque landscape for the pleasure and wonder of the Duncombe family and their friends. Pignut is a member of the carrot family, along with parsnip, fennel, parsley and less ‘benign’ plants such as hemlock and giant hogweed. Like some other members of the carrot family it has an edible tuber. The small tubers have been eaten by pigs hence its most common name (another name – St Anthony’s Nut – is because St Anthony is the patron saint of many many things including swine herders), and also by people who like to forage. Obviously never ever eat anything unless you are absolutely definitely sure what it is, and don’t dig on other people’s land without their permission. Pignut is a short plant which flowers in early summer with tiny delicate white umbels (flat topped flowers on stalks like umbrella spokes coming from a single stem) that together resemble lace. It’s a tough little thing containing both male and female parts and therefore is self-fertile relying on pollinators like hoverflies, and also moths. It is an indicator of grassland/woodland pasture and can be found on road verges and alongside hedges where fragments of old pasture and woodland survive. Usually people probably wouldn’t want to go on holiday to a pigsty, however there is a particular listed building in the North York Moors that isn’t many peoples’ idea of a home for pigs. Described in the listing description as “a large dwelling for pigs” this pigsty was built in the late nineteenth or early twentieth century by John Warren Barry – a Whitby shipbuilder and ship owner who was the owner of Fyling Hall near Robin Hood’s Bay. He seems to have been inspired by the classical architecture he came across on his travels around the Mediterranean as the pigsty is built in the style of a Greek temple with timber pediments at both ends and a portico of six timber columns with Ionic capitals in its south side. It contained two small sties, and was intended to provide accommodation for two pigs, whose attendants were to be housed in a pair of neighbouring cottages. The pigs were apparently unimpressed and unappreciative of their sumptuous quarters. In time, lacking any obvious practical use, the Pigsty fell into a poor state of repair. Luckily it was purchased by The Landmark Trust in the 1980s. The Landmark Trust aims to preserve remarkable buildings by providing them with new purpose. The pigsty has been restored, converted and extended for use as a holiday cottage. The extension is minimal which enables the principal building to remain the main focus and the conversion works have managed to maintain the original character. The Pigsty certainly adds to the diversity of the built conservation of the North York Moors. It was apparently Mr Barry’s intention that the pigs should enjoy unrivalled views across Robin Hood’s Bay – a privilege that holiday-makers instead are fortunate to have today! 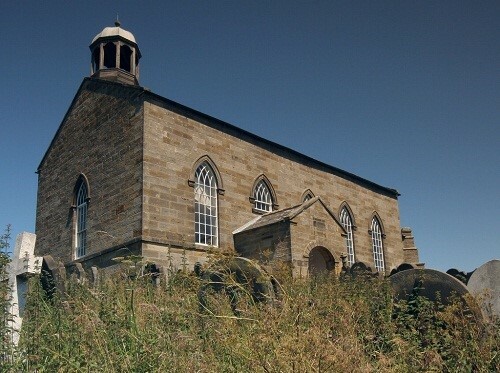 In a number of villages and dales in the North York Moors as well as an established Church building there will be a Methodist Chapel building (sometimes known as a Wesleyan Methodist Chapel), and in some there also is, or was, a Primitive Methodist Chapel in close proximity. In Chop Gate the Wesleyan Chapel and the Primitive Chapel stood back to back, as if choosing to ignore each other. Methodism had made early in-roads in the North York Moors in the 18th century where the location of the area, out on a limb, provided a home for dissenting religion. The Primitive Methodist ‘connection’ splintered off from the Methodist Church at the beginning of the 19th century when the preachers William Clowes and Hugh Bourne were dismissed from the main congregation. Primitive Methodism was so called because its converts believed it was they who were following more strictly and truly in the footsteps of original Methodism and its founder John Wesley. One particular aspect of early Primitive Methodism was the holding of open air prayer meetings encouraging evangelical conversions, as the Wesleys had done in the century before. This was at a time when the meeting of ordinary people in groups, unsanctioned by Society and Authority, were considered a danger to the status quo. 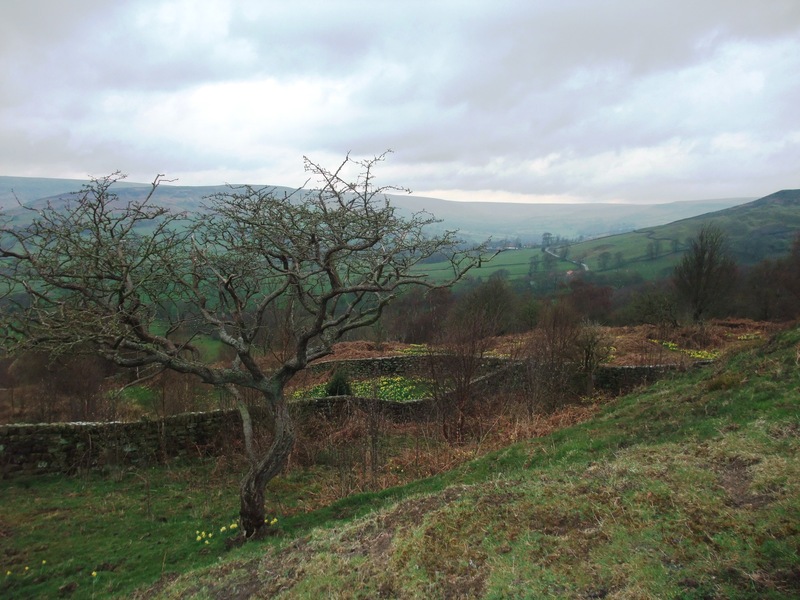 ‘On Sunday, July 30th , he [William Clowes, one of two founders of the Primitive Methodist connection] conducted a camp-meeting [open air meeting] upon a depressed part of a mountain called Scarth Nick [near to Osmotherley]. About two thousand persons were supposed to be present. The Word preached was attended with much Divine power; the prayers of the people were very fervent, and many sinners were deeply impressed. Four or five persons were made happy in the love of God; one of whom, a farmer, was so overjoyed that he called upon the hills and dales, and every thing that had breath, to help him to praise God. He afterwards hastened home, and told his wife and servant what the Lord had done for his soul, and they also sought and found the salvation of God….He [Clowes] had invitations to Weathercote, and to Auterly [now Orterley] in Bilsdale [these two sites are still farmsteads], at both of which he preached with great effect, and many were brought to God. Many exciting scenes were witnessed during his missionary tour in this district, and a great awakening took place among the inhabitants, which we can not particularize’. A History of the Primitive Methodist Connexion by John Petty, 1864. The Primitive Methodists emphasized the role of the lay congregation rather than a clerical hierarchy and this included a sense of equality that allowed for women preachers. They valued simplicity in worship and believed that their Christianity demanded political engagement in the modern world. Primitive Methodism appealed particularly to the rural poor and the industrial immigrant labourers, to whom the promise of reward in heaven might have seemed like a longed for relief. The Primitive Methodist Church in Britain reunited with the main Methodist Church in 1932. Polyhalite is a mineral lying deep (over 1,000 metres) under the North Sea and along the eastern edge of the National Park; it’s a type of Potash. It was formed over 260 million years ago as salts were deposited in a shallow sedimentary sea as it evaporated. Polyhalite specifically contains potassium, calcium, magnesium and sulphur; useful components in agriculture fertilizer. Alongside the existing Cleveland Potash Mine at Boulby (ICL UK), over the next 5 years the new Woodsmith Mine (Sirius Minerals) is being constructed in the National Park to extract naturally formed polyhalite for commercial use. The new mine is expected to be operational by 2021 and whilst the development work is taking place, a whole range of compensatory and mitigation projects to enhance the natural and historic environment and to promote tourism in the wider area are being delivered. The first of these initial priority projects for this year include the upgrading of a 4km section of the Coast to Coast at Littlebeck and improvements to the Lyke Wake Walk, repairs and renovations to the Grade 1 listed Old St Stephen’s Church at Robin Hood’s Bay with The Churches Conservation Trust, and habitat restoration within Harwood Dale Forest. It is very difficult for us now to appreciate the full horror of what the servicemen who fought in the war experienced. Similarly we can only begin to imagine what it must have been like for those at home left behind without fathers, husbands, brothers and sons. In the aftermath of the First World War thousands of built memorials to the dead were erected across Britain. These communal memorials acted as shared totems for society suffering devastating loss and in the face of the official policy of not repatriating the dead. They provided an embodiment of the common grief felt and the validation of sacrifice, and still today provide a tangible reminder of the real impact of war. Whereas the huge numbers of dead and injured are difficult to grasp, the individual names of the local people lost are poignant and tangible. War Memorials draw particular public interest and warrant serious consideration for listing. Historic England is particularly keen during the centenary of the First World War to increase protection of unlisted memorials. Following on from the listing of the Commondale Shepherds’ Memorial last year, we are pleased that two further war memorials in the North York Moors have been afforded Grade II listed status as part Historic England’s drive to protect for posterity these meaningful and evocative structures. Glaisdale War Memorial was unveiled on 4 December 1920 by Major General Sir James K Trotter, FCB, CMG. It is an elegant example of a Latin cross set on a tapering octagonal section shaft and displays a high level of craftsmanship with carved decorative details and fine lettering. Its prominent location on a small green with expansive views north down Glaisdale contributes to its impact in recalling the memory of the dead and where they belonged. The plinth at the base of the shaft reads ‘TO THE MEMORY OF THE MEN OF GLAISDALE WHO FELL IN THE GREAT WAR 1914-1919 JESU BLEST GRANT THEM IN THY LOVE TO REST’. There are thirteen names: John Boas, William J M Child, James Jefferson, John Pearson, Ralph Scarth, Charles E Scanlon, John H Scarth, Frederick Scarth, Francis R Scarth, William Ward, Ernest Wilson, Pennock Winspear, Harry Winspear. 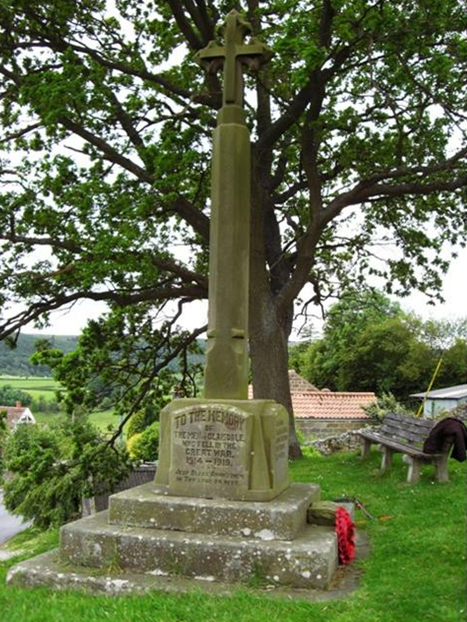 The Commondale War Memorial was unveiled by Lord Guisborough at an ecumenical ceremony held on 31 August 1921. It was designed by WH Earl of Danby and made by J Ford of Castleton. The memorial commemorates nine local servicemen who died during the First World War including the two shepherds commemorated by the aforementioned Grade II listed Shepherds’ Memorial. The names are Thomas Monk, Samuel Lawson, Thomas Gibson, Robert H Leggott, William Hill, Frederick W Robinson, Charles E Foster, Alfred Cockerill, David Johnson. It comprises a stone Latin cross on a short tapering square-sectioned shaft which rises from a plinth set on a four-stage square base. Set into the plinth are unusual, brown salt-glazed stoneware tablets probably made by the local London and Cleveland Fire Brick Co Ltd Brick and Pipe Works. On the main facing and rear tablets are stamped the words ‘IN HONOURED MEMORY OF THE MEN OF COMMONDALE WHO GAVE THEIR LIVES FOR GOD, KING AND COUNTRY, IN THE GREAT WAR 1914-1918. THEIR NAME SHALL LIVE FOR EVER AND THEIR GLORY SHALL NOT BE BLOTTED OUT. LEST WE FORGET’. For anyone interested in finding out more about the war memorials in the North York Moors and the men commemorated please visit the Roll of Honour website. For communities wishing to carry out repairs to their War Memorial it’s worth contacting the War Memorials Trust as grant aid and advice are often available. For further advice about how to apply to have a War Memorial listed please contact the National Park Authority’s Building Conservation team on 01439 772700. Whether by accident or design these were our top 5 posts in 2016, according to the number of views. If you’re a land manager and you’re interested in grant to help you create, manage or improve your own woodland masterpiece – here’s a link to the national funding that’s available. Watch out for the set application windows because they’re often quite short. Although partly demolished in the 18th century to bring it ‘up to date’, and extensively refurbished in the 20th century to make it look ‘olde worlde’, the building retains considerable evidence for a high-status late mediaeval timber framed house of two jettied storeys (where upper storeys project beyond the lower storey) and attics in a prominent position. The house is of an unusually large scale. Other comparable size houses in the wider area are from much later dates. Now that the building is free from the unfortunate results of the 20th century remodelling it is possible to see it as it really is – ‘the battered remnant of late mediaeval construction work on the grand scale carried out by an unusually wealthy owner’. In 1478 Helmsley was sold to Richard, Duke of Gloucester, later Richard III; it reverted to the de Roos family on his death. The name of the subsequent hotel is suggestive of a reference to this short lived but significant royal ownership. In its latest adaptation, the building is now a shop. Following our work in 2014-15 (reported in early 2016), we were pleased that Historic England were able to remove one of the coastal alum working Scheduled Monuments from the Heritage at Risk register because we had fully recorded those parts of the monument which were under threat. However, four other Scheduled alum working sites remain on Historic England’s Heritage at Risk Register despite our efforts to record some of their most vulnerable features. So what next? Working with Whitby Museum and specialists from Historic England, we held a seminar last spring bringing together a group of dedicated people with a strong interest or connection to the coastal alum working sites – landowners, archaeologists, academics and private researchers – to review what we know about the alum industry, to decide what we don’t understand and to look for a way forward to manage the risk to the sites under threat and ensure that we do not lose the valuable information held within them. One of the ideas emerging from the seminar was a further excavation project with an emphasis on engagement and interpretation as well as research. Archaeological excavations take considerable planning and funds to ensure that they are carried out to a high standard and achieve objectives without causing accidental damage, so it can be a slow process getting started. 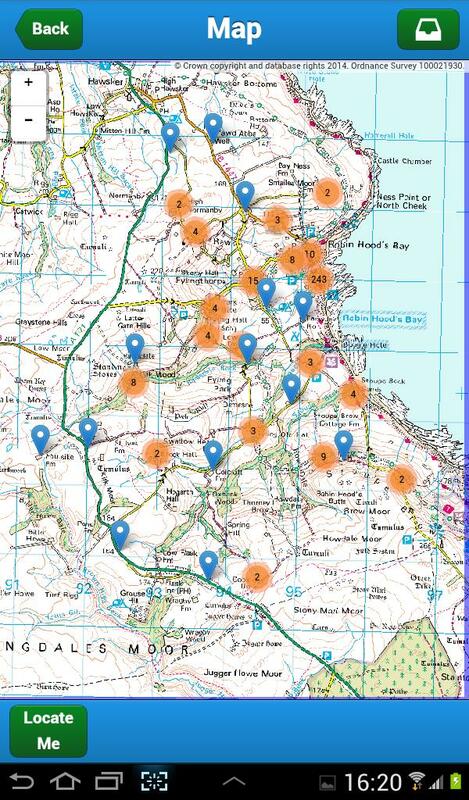 We are now working towards setting up a project to investigate one of the sites which we didn’t include in the investigations in 2014-15 – the alum works at Stoupe Brow, near Ravenscar. An extensive system of reservoirs and water leats (dug channels) was revealed on the nearby Fylingdales Moor after the 2003 wildfire and we know that this water management system supplied the needs of the alum processing at Stoupe Brow, but other than that we currently know very little about this site. Historic England recently completed a topographic survey of the earthworks so we can now see how the site was laid out, but not how it operated. The site still includes its alum house (where the final processing to produce alum crystals was carried out) and there is still a general gap in knowledge when it comes to how alum houses functioned. As well as trying to discover more about the practical operations at the site the project will record the structures which are currently being gradually lost over the cliff edge. A big advantage of this particular site is that it is more accessible and less dangerous compared to some of the other coastal alum working sites – providing great opportunities for volunteers and visitors. The first stage of the project is producing a project proposal which will outline what we want to do and how much it will cost, and this is expected by the end of this winter. The next step will be using the proposal to generate partnership support and seek funding. It is early days yet, but we hope this will develop into an exciting project – watch out for further posts as our plans progress. Christmas Tree Field, Jingleby – This is a double hit of a Christmas sounding site within Dalby Forest. The archaeology of the wider area is significant and complex. The area includes Bronze Age round barrows, and a number of embanked pit alignments (prehistoric linear boundary earthworks) as well as later banked field boundaries which might be connected with rabbit warrening. There is also documentary record of a Jenglebee Cross but its exact location isn’t known. Although these particular boundary stones are not Listed or Scheduled, there are many that are. 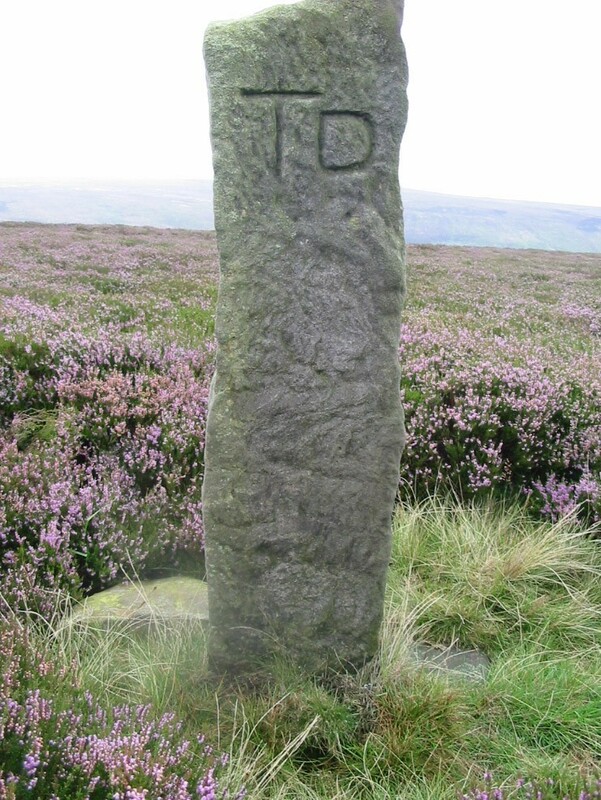 Boundary stones identify the start of a land boundary or the change in a boundary, especially a change in direction, and are a feature of the North York Moors. They are often marked on the most relevant face with the landowner’s or parish initials to indicate the ownership. Like waymarker stones they would have been important features for people having to cross the moors, defining the route to follow in a landscape which has very few points of reference. Stocking Lane and Stocking Hill. There are a couple of Stocking Houses – this Stocking House, to the north-west of Westerdale, is a group of unlisted buildings. 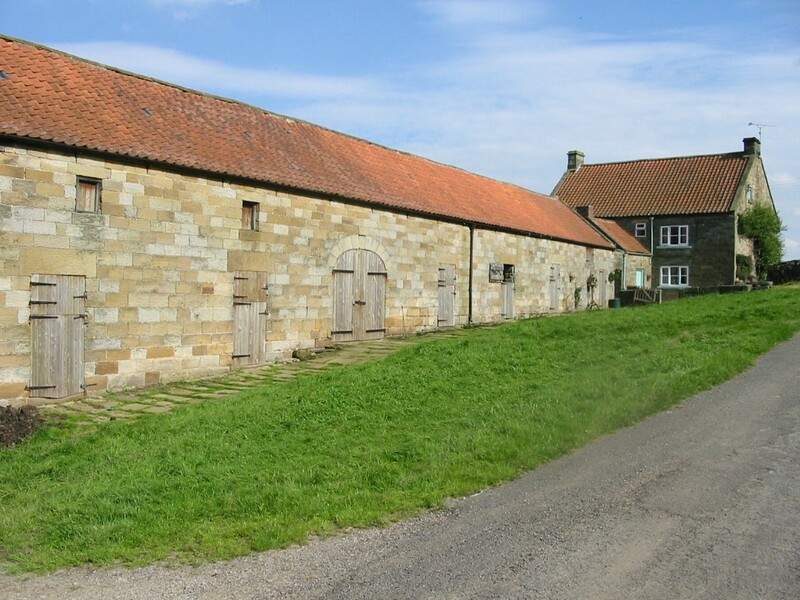 Although not listed, together these buildings are typical of a traditional North York Moors moorland farmstead – small in scale, linear in form and of stone and pantile construction. farmhouse dated 1826. The range includes a threshing barn with a horse engine house (for horse powered machinery) attached to the rear. Close by the farmstead there are a number of staddle stones (arranged to lift structures like granaries or haystacks off the ground), the remains of a saw pit (in which to operate a two handed vertical saw for timber) and also a chambered sheep fold which has been used to hold bee hives. eighteenth century house. This building is a good example of how a building has evolved over the years – probably originally a traditional longhouse it has clearly been raised at some point in its history and also extended. 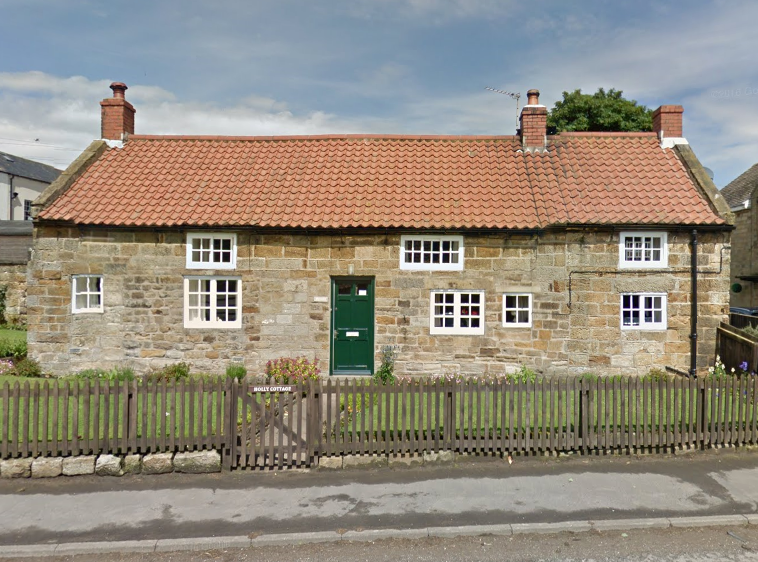 The variation in windows style, sizes and their location on this elevation all add to its unique character and adds to its special interest and architectural character and is typical example of the North York Moors vernacular. Following on from our last blog post about lime mortars and traditional buildings – there are a series of upcoming workshops over the next few months on using hot mixed and other traditional lime mortars, aimed at practitioners in the north of England. The Building Conservation team at the National Park have a vested interest in keeping the area’s traditional buildings in good repair so as to maintain and secure this particular element of the North York Moors’ special qualities. We have a new Advice Note on using lime mortars, the rudiments of which are explained below. Most buildings in the North York Moors were traditionally constructed using stone and lime mortars (to bind the stonework together), often with earth and rubble filled cores. Lime was used for bedding and pointing the stonework and for rendering. Rendering with mortar was used to cover poorer-quality masonry underneath or to make a building more weather proof, for example on the coast. Most historic buildings were constructed from materials found locally and this contributes to what is distinctive about the ‘local vernacular’. When it comes to repairing a surviving traditional building it is important to understand how they work. These buildings are usually of simple construction and built using breathable materials. Bricks and stone are bonded with flexible and permeable mortars made of lime and sand which allow the building to ‘breathe’. When it rains moisture is absorbed into the external surface but is then able to evaporate through the more porous pointing or render. Using a lime based mortar or render for repairs nowadays means that this process can continue. In contrast modern cement mortars and renders along with plastic paints, waterproof sealants and damp-proof courses all act as barriers to a traditional wall’s natural ability to breathe. The trapping of moisture within permeable materials like stone can exacerbate the very problems these products are trying to resolve. The use of cement-based mortars can have a significant negative visual (photo below left) and physical impact on traditional historic buildings. The photo below (right) shows the extent of stone decay caused by the use of a cement mortar. Because the cement is much harder than the stone, moisture cannot evaporate through the joints and instead evaporates through the stone causing it to ‘weather away’ through premature erosion. You can usually tell what type of mortar has been used most recently; cement based mortars tend to be dark grey and hard in appearance and texture whereas lime based mortars are generally lighter and softer in appearance and texture. Because they allow the surrounding masonry to dry out the colour of the stone will also lighten. There are a number of different types of lime mortars/renders. Replacing like for like is important. Non-hydraulic lime is the raw material produced when limestone (calcium carbonate) is fired, often called ‘quicklime’ (calcium oxide). It is sold in a slaked form (with water) as lime putty which is then mixed with an aggregate (e.g. sand) to produce mortars and plasters. These putty limes possess good breathability and flexibility and are ideal for use with soft porous materials allowing the maximum permeability. Hydraulic lime comes in powdered form and will start to set as soon as it comes into contact with water. It is ideal for use in wet or very exposed situations or where there is a need for a higher compressive strength or a quick set. Hydraulic limes come in a variety of strengths e.g. NHL2, NHL3.5 and NHL5 – the higher the number the less flexibility and breathability the mortar will have. Hydrated or bagged lime is a form of non-hydraulic lime which is sold as a powder. It is sold by builders’ merchants as an additive for cement mixes in order to give modern cement mixes more plasticity and workability. It is generally considered to be inferior to lime putty, not least because an unknown proportion will have reacted with carbon dioxide and set by the time it reaches the site. Hot-mixed lime is made when quicklime is mixed with water and aggregate simultaneously. The vast majority of historic lime mortars were probably hot-mixed. There are several benefits of using a hot-lime mortar: it can produce cleaner work as there is less leaching, it has a easily-workable elasticity which produces solid and full joints, it appears to be more breathable and therefore more compatible with stonework, and it has potential for use in colder weather notwithstanding the requirement for protection from freezing during the curing (setting) process. A standard pointing mix consists of a lime mortar mix of 1:2½ lime:sand (sand mix of 50% sharp sand and 50% builders sand) for a slightly recessed bagged finish. However there may be times when a bespoke mix is required such as when different colour sand is needed to match existing historic mortar. Repointing is only needed where mortar has become loose, decayed or eroded to an extent that water has started to penetrate the joints. If the mortar is firm or so hard that it needs to be chiselled out then it is best to leave it in place as removal could damage the masonry. The repointing of delicate ashlar joints (made out of worked stone) is not generally advisable as the joints are so fine that getting old pointing out can lead to irreversible damage of the masonry. If repointing is necessary joints should be carefully raked out manually or by non-electric tools (no angle grinders) to a depth equal to one and half times the width of the joint and never less than 35 mm. Great care must be taken to keep the edges of the stone intact and joints should never be widened. Work should not be carried out when there is a danger of frost or heavy rain (this is less important when using a hot lime mix). Mortar must be protected from drying out too quickly from wind, rain and frost by protecting the area. Rain must never be allowed to strike the mortar and stonework until the setting process is complete. The mortar should be stippled as the initial set takes place, with a stiff bristle brush, to produce a textured appearance capable of shedding water and slightly set back from the stone outer surface to ensure the full arris (edge) of each stone shows clearly in relief. The photo below (left) illustrates a good lime mortar mix and pointing method. The aggregate used in the mix has been exposed by brushing back the pointing to a recessed finish which allows the stone to be the dominant feature. The other photo below (right) shows historic pointing on an old outbuilding where roof tiles were used to fill in larger gaps between the stones, adding to its particular character and appearance. If you need further information, or advice on sources of materials, or any clarification regarding the need for listed building consent or planning permission before re-pointing or rendering a traditional building, get in touch with our Building Conservation Team. the existing farmhouse. Nuns from Rosedale Abbey in the south of the North York Moors were sent to this outlying subsidiary house as a penance, presumably because of the difficult journey required to get there over the moors and possibly due to the hard day to day life once they got there although little documentary evidence survives to help us understand what life would have been like for the women who lived and worked at Handale Priory. In the centuries following the Reformation and the dissolution of the monasteries, the Priory’s surviving mill building was used for the manufacture of cotton undergarments and the Priory ruins were incorporated into a new farmhouse and walled garden. 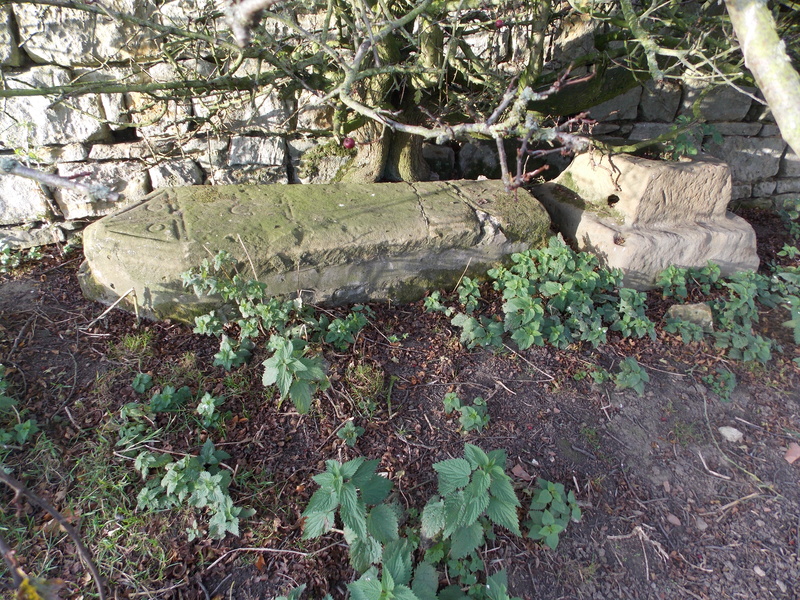 Evidence of the Priory can be seen today in the medieval fish pond to the south of the walled garden and the medieval tomb lid and cross base which have been relocated to the base of the medieval wall to the left of the farmhouse. There is a small carved stone that stands next to the tomb which is a memorial to the last cart horse at the farm before diesel engines took over. There is also a less historic more fantastical tale associated with the site too. Local legend tells of a ‘loathsome serpent’ that lived in the area and would steal beautiful maidens from nearby Loftus, bringing them back to its lair at Handale to devour. One day a brave knight called Scaw killed the serpent and rescued one of the beautiful maidens called Emma Beckwith from the serpent’s lair. The couple wed and presumably lived happily ever after. The nearby wood is known as Scaw’s Wood. In 1830, along with 16 other burials (possibly remains from the nuns’ graveyard) a coffin was found on the site with a picture of a sword and the words ‘snake slayer’ carved in the lid. The skeleton inside was apparently holding a four foot long sword and so naturally was believed to be Scaw himself. the site which was in a parlous state and classified as being at ‘extreme risk’. The project also commissioned an imaginatively designed interpretation panel and bench, and a contemporary gate to keep cattle out. At this current time permissive access into the garden is still extant and visitors are welcome. 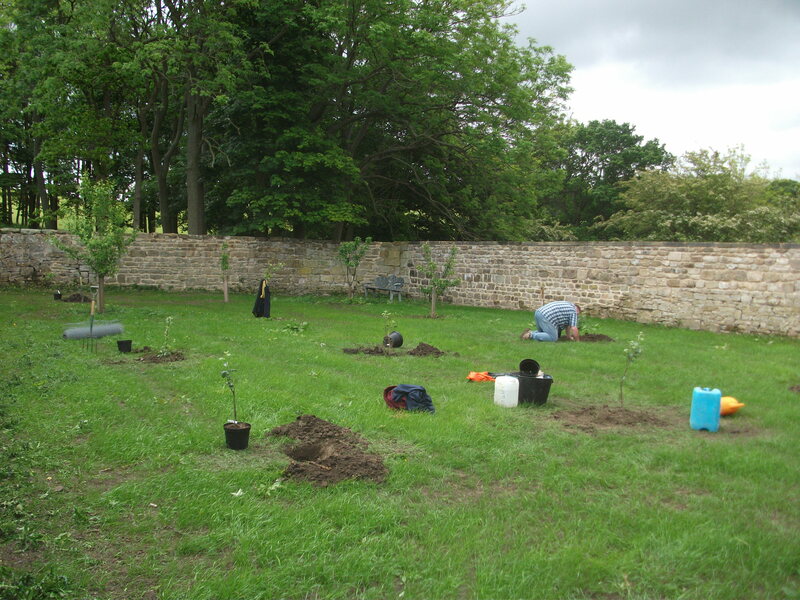 Along with the local apple varieties introduced into the reinvigorated garden there were also initially bee hives. The current owners would be keen to host new hives if anyone is interested in producing Handale Honey. The North York Moors is renowned for its heather – the largest continuous expanse of heather moorland in England and Wales – which blooms purple during the summer months (July/August). The display is mainly made up of three species – Bell heather (Erica cinerea), Ling heather (Calluna vulgaris) and Cross-leaved heath (Erica tetralix). The main difference between a heather and a heath plant is their leaf structure. In addition there is a record of another heath plant in one location on the North York Moors – St Dabeoc’s Heath (Daboecia cantabrica) – which is more familiar in the west of Ireland. 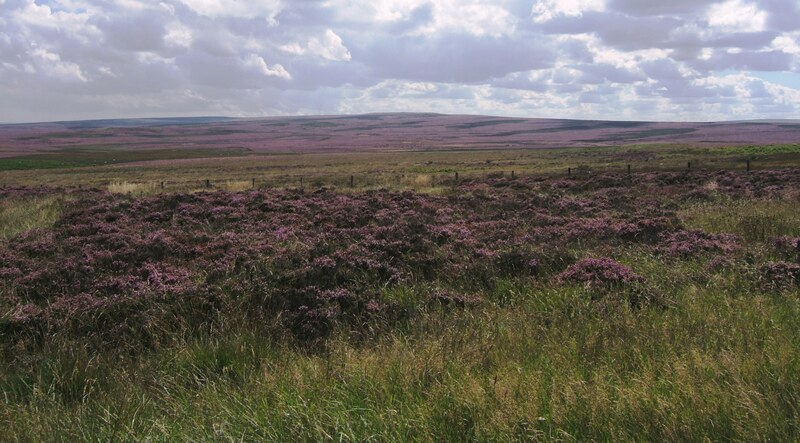 The moorland habitats of the North York Moors are dominated by heather and heath. The dry climate in the east of England favours NVC (National Vegetation Classification) types H9 Calluna vulgaris – Deschampsia flexuosa, with some H10 Calluna vulgaris – Erica cinerea heath on well-drained areas and large areas of H12 Calluna vulgaris – Vaccinium myrtillus heath on steeper slopes. However there are also smaller areas of M16 Erica tetralix – Sphagnum compactum wet heath. From North York Moors Special Area of Conservation site details. 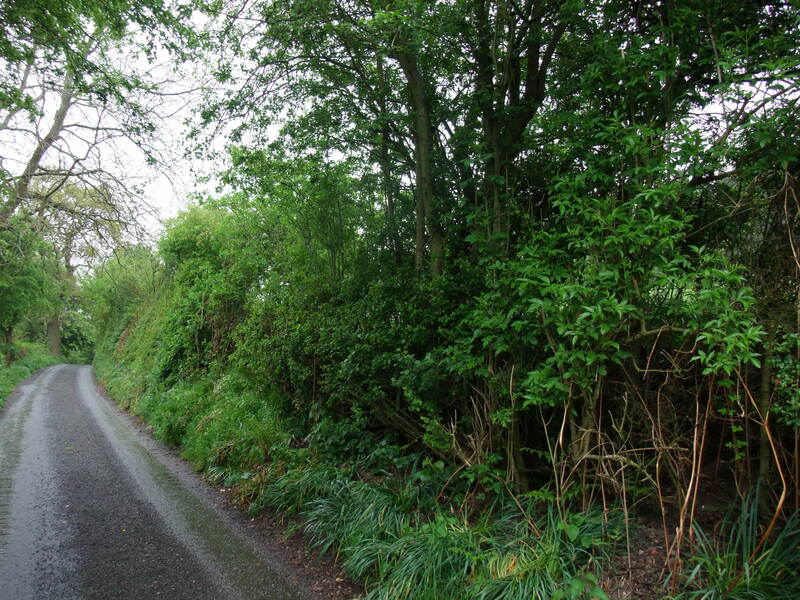 Hedgerows are man-made lines of trees managed and manipulated to demarcate boundaries and to control stock. Every hedgerow will have had a purpose and every hedgerow has a value. Hedgerows can develop their own understorey of plants and provide shelter and food for invertebrates, birds and animals. They act as living connecting corridors between other habitats and are important visual features in an English landscape. Hedgerows can last as hedgerows for a very long time as long as they continue to be managed and the longer they last the more biodiverse they can become – one new plant species establishes in a hedge about every 100 years. Because of the importance of hedgerows in the North York Moors we’re offering grants to help land managers regenerate and gap up their valued hedgerows. Where hedgerows no longer have an agricultural purpose they might be seen as a hindrance to modern land management. To remove an agricultural hedge more than 30 years old a land manager must apply to the Local Planning Authority for a Hedgerow Removal Notice (under the Hedgerow Regulations 1997); for the North York Moors National Park we’re the Local Planning Authority. When this happens we need to establish whether the hedgerow is ‘important’ according to a number of set criteria that consider both its ecological and historical value. If the hedgerow is ‘important’ the hedgerow is retained and if it isn’t, the hedgerow can be removed. There are very few applications for hedgerow removal in the North York Moors. Herbert Read (1893 – 1968) was born at Muscoates Grange in Ryedale, just to the south of the North York Moors. As a child, following the death of his father, his family moved from the pre WW1 countryside to the city (Leeds and Halifax to be precise). The feelings engendered of loss and contrast had a profound effect on him. During his lifetime Herbert Read was an army officer, a bank worker, a museum curator, an academic, a journal and book editor, a writer, a poet, a theorist and critic. He co-founded the Institute of Contemporary Arts and was President of the Society for Education in Art. He was a prodigious thinker and believed in art as a necessity for society. He saw art as a natural organic phenomenon that comes out of a need for expression and championed modern British sculptors and artists of the mid-20th century. Despite being a theoretical anarchist he was knighted in 1953. Herbert Read returned to Ryedale in his later years. Here he wrote about his recollections and current thoughts, now that he was back. Highland Cattle are great at conservation grazing, they’re particularly hardy, and they’re also extremely placid. There are currently five Highland Cattle on the coastal slope at Common Cliff (also known as Beast Cliff) near Ravenscar. Common Cliff is a 44 hectare area of undercliff habitat at Ravenscar. The site is designated as a Special Area of Conservation (SAC) and a Site of Special Scientific Interest (SSSI) for its seacliff grassland communities; however these grasslands are being encroached upon by rank grasses, bracken and scrub. So a 5-year conservation grazing programme was introduced in 2015, hence the cattle. Defoliation – The cattle are ideal for removing long, coarse vegetation – they wrap their tongues around the vegetation pulling tufts into their mouths which leaves a tussocky appearance. Removing this coarse vegetation will allow wildflowers, such as the Common Spotted Orchid, to flourish. Cattle are less selective grazers (compared to sheep or ponies) and do not eat flower heads, unlike sheep. 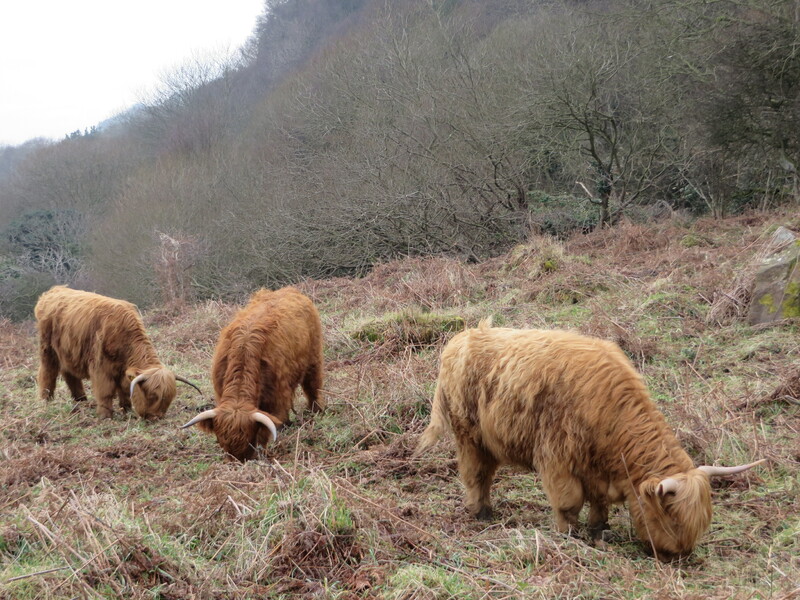 Trampling – Cattle are heavy animals and as they walk around the site, they trample the vegetation, creating pathways through the bracken and scrub, opening up the dense sward and suppressing growth of these unwanted species. Hoof marks can also create germination niches – areas where wild flower seeds can germinate. 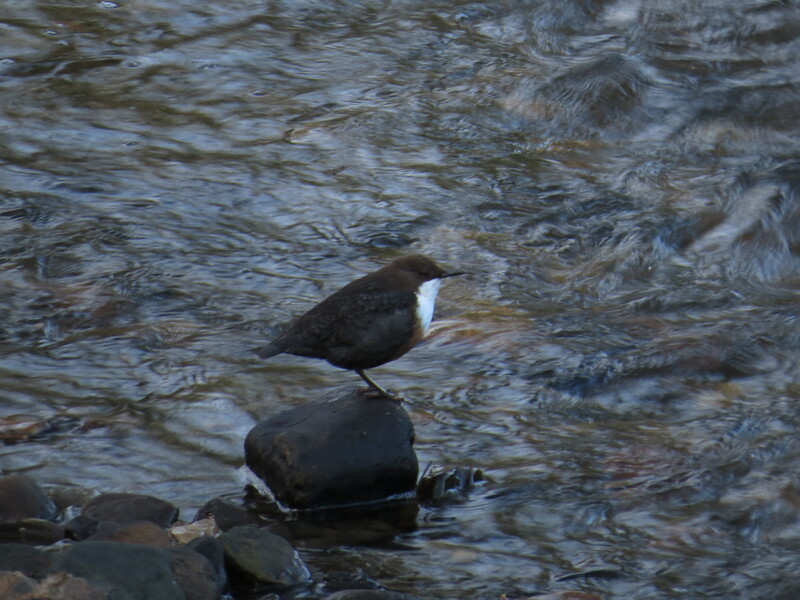 Dunging/manuring – Dunging returns nutrient back to the soil whilst also providing a food source for invertebrates. Because of their hardiness the cattle can remain on the sea edge site throughout the year. They are also very sure-footed, a must for grazing on coastal slopes! The stock is checked regularly, the site has been fenced to help manage the animals, and there is a year round water supply, to ensure that the cattle stay happy and healthy. Traditional Estates Craft Apprenticeship Project (2012-2014) – In partnership with the University of York, and Historic England we launched a new apprenticeship scheme which offered three young apprentices hands-on experience in a range of building maintenance and conservation skills. Hosted by Estates in the North York Moors the apprentices gained the specialist skills needed for conserving the nationally important built heritage of the National Park whilst achieving their NVQ Level 2 at York College. The initial project was so successful we’re hoping to follow it up with a new Trailblazer Apprenticeship. New Listings – Historic England advises the Department for Culture, Media and Sport, on which heritage assets are nationally important and should therefore be protected by designation. Buildings and structures which meet the criteria for national protection are listed. This protection system has been in place since 1947 and operates under The Planning (Listed Buildings and Conservation Areas) Act 1990. The test for listing is architectural or historic special interest, with the final decision to list being taken by Government. Recently within the North York Moors Historic England has listed a rare surviving Clapper Bridge and a Battle of the Somme War Memorial on Commondale Moor. Monument Management Scheme – This is a partnership initiative largely funded by Historic England which has been running in North York Moors since 2009; we’re now into Phase 3. The essential aim of MMS is to improve the condition of scheduled monuments and ultimately to remove ‘At Risk’ monuments from the Heritage at Risk Register, using the most practical means available. The current Register includes 54 of the National Park’s 841 Scheduled Monuments (as of November 2015) – a big reduction from the 198 which were ‘At Risk’ when the MMS began in 2009. 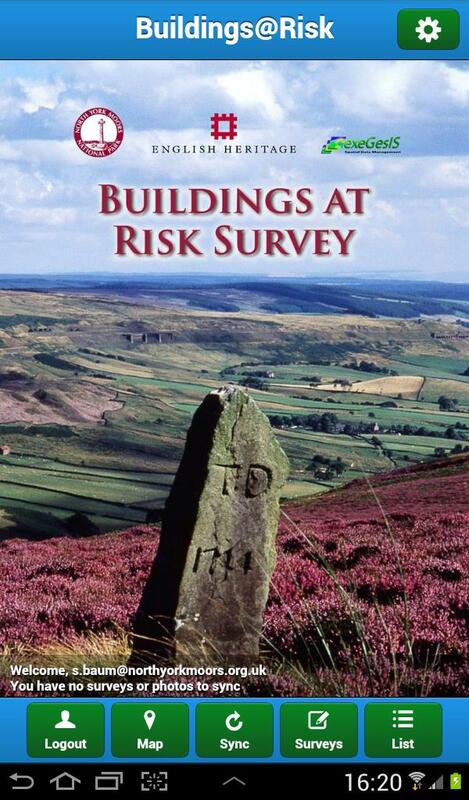 Buildings at Risk Survey Pilot – Using funding from Historic England, we created a smart phone survey application to help with condition surveys of listed buildings. The App allows volunteers to remotely access information about the National Park’s listed buildings and enables on-site condition assessments to be carried out and data automatically updated. With a runners-up prize from the Campaign for National Parks’ Park Protector Awards, we were able to refine the App and Historic England have since used the concept to create their own version which is now being trialled prior to launch. 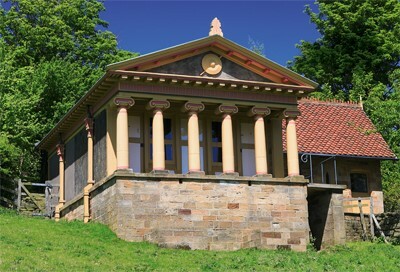 Grant provision and advice – Joint funding projects between the National Park Authority and Historic England have enabled the removal of several key buildings from the Buildings at Risk Register recently, like the Ionic Temple and Nelson Gates at Duncombe Park in Helmsley. The Authority also liaises closely with Historic England in providing coordinated expert advice to support the conservation of important historical sites in the North York Moors, such as Whorlton Castle Gatehouse and Arden Mill on the River Rye. Historic England have lots of useful advice notes and guidance on managing and maintaining our built heritage, for example suggesting sensitive and practical ways for home owners to improve the energy efficiency of listed buildings such as draught-proofing of windows, secondary glazing, cavity walls and insulation. A lot of cultures have their own ‘other folk’. These other folk have lots of different names such as Fairies, Trolls and Goblins; in the North York Moors they are known as Hobs. Hobs are little and aren’t renowned for their good looks. They can be very helpful and are keen to work hard, just as long as you are grateful in return. If you’re not suitably grateful or you try and trick a Hob – woe betide you. The National Park has a team of Volunteers known as The Hobs. They’re not necessarily little or lacking in good looks but they do work hard. 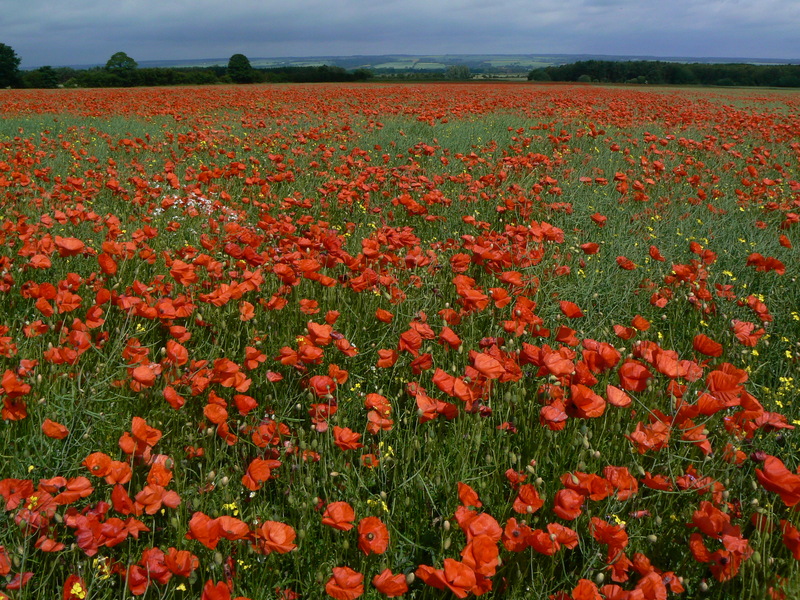 To mark the centenary of the start of the Battle of the Somme on 1 July 1916 fifteen war memorials across the country have received new or upgraded listings from Historic England. The Battle of the Somme in northern France was made up of a series of offensives and counter offensives which lasted 141 days, and the aftermath was an approximate one million dead and wounded. World War I in 1914. It must have been an exciting adventure. Alf was shot in the head in the first month of the Battle of the Somme; he did not die immediately but was declared unfit for further duty. He eventually died back in England in August 1920 at the age of 31(?) as a result of his brain injuries having never escaped from the consequences of the Battle. It is wishfully suggested his ashes are scattered close by the site of the memorial. Robbie was killed in September 1916 aged 19, during another assault on German lines. His body was not identified and so wasn’t returned to the North York Moors. There is a war memorial in Commondale village and both men are also recorded there. This specific memorial purposefully placed on the moorland above the village was commissioned by the daughter of the first Baron Guisborough in 1920. In the years immediately following the end of World War I recording and remembering the loss endured became a national preoccupation. The Historic England listing cites the historic interest of the memorial as ‘eloquent witness to the tragic impact of world events on the local community, and the sacrifice it made in the First World War’. GUARDSMEN ROBBIE LEGGOTT KILLED IN ACTION 1916. ALF COCKERILL DIED OF WOUNDS 1920.